You can never say Thank you too much. But it is nice to try. A great tradition in our parish family is the annual volunteer appreciation dinner. This is a dinner to which all who volunteer in any capacity at the parish are cordially invited. Please see page 10 in the bulletin here for more details, and I’d also love to have your nominations for possible volunteers of the year! 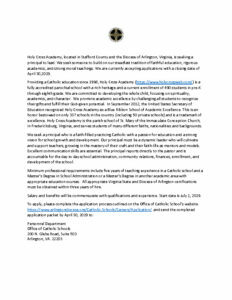 Email nominations to: edoyle@stmaryfred.org. Speaking of Elena Doyle…. she has recently been promoted within the office staff to be my Executive Assistant, in addition to continuing to help with outreach. Having her work full time will help us to accomplish even more! Welcome Elena! Additionally, Chris Lanzarone is taking on additional responsibilities for the Facilities. He has a wealth of knowledge of how and why our facilities run as they do, and is excited to face the challenge of these new responsibilities. There is one more new person potentially coming on board part time, and we are working out the details with their schedule to be able to help use their gifts in service of our parish family. Thanks to all who applied last month in response to my unusual job listing. I wish I could have hired many more of you as each has some amazing gifts and talents to share! Vocations awarenesses week is celebrated this week, and we are privileged to have a seminarian with us speaking at all the Masses this week. Perhaps this week you might find the courage to encourage a vocation! Maybe you can say to someone you know, “I think you would make a good ______ (priest or deacon or sister)!” You never know if you might be a part of the means by which the Lord draws someone to serve him with their lives!